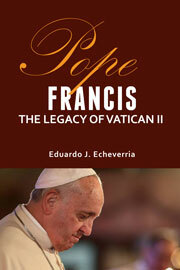 Recently released is Professor Eduardo J. Echeverria’s study Pope Francis: The Legacy of Vatican II. Catholics and Protestants alike tend to use Pope Francis’s pronouncements to justify the correctness of their own viewpoints on Vatican Council II and other religious and theological matters. Professor Echeverria does a thorough job of drawing from the pre-papal writings of Jorge Mario Bergoglio and the man’s current papal writings, talks, and sermons to discover and document the continuity in thought Francis has with the councils. Echeverria compares Francis’s discourse with that of his papal predecessors in the era since Vatican II. He draws heavily on the documents of Vatican II and the theology of doctrinal development stemming from the First Vatican Council and embraced by Vatican II. Not left out is the modern ecumenical movement from both the Reformed and Catholic side. This book draws high praise from prominent theologians whose full endorsements can be found here. It is an ideal text for basic theology courses, courses on the modern Church for seminarians or divinity students, or courses about the influence of Vatican II. It’s a must-read for those wanting to learn about Pope Francis and the future of Christianity. A special strength of the book is the respect with which it treats the Reformed Tradition.